We still need more information to restore our original. This manuscript riddle was found on reverse of Lumsden's Royal and Entertaining Game of Goose in the games collection at The Puzzle Museum. To circulate the joke and splendid Coin. It has been baffling us for decades. Can you tell us the answer? 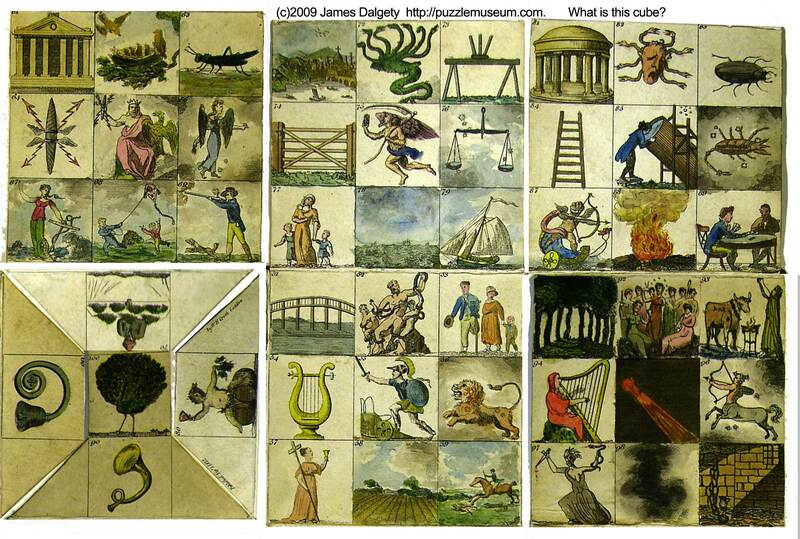 Do you know where we can see another copy of this jigsaw? Ours is missing a couple of pieces and we need to see a complete image so that we can restore ours. 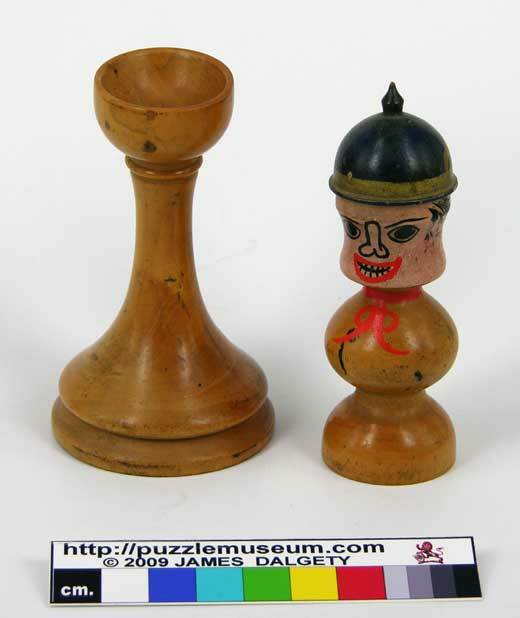 The jigsaw was made by John Betts. 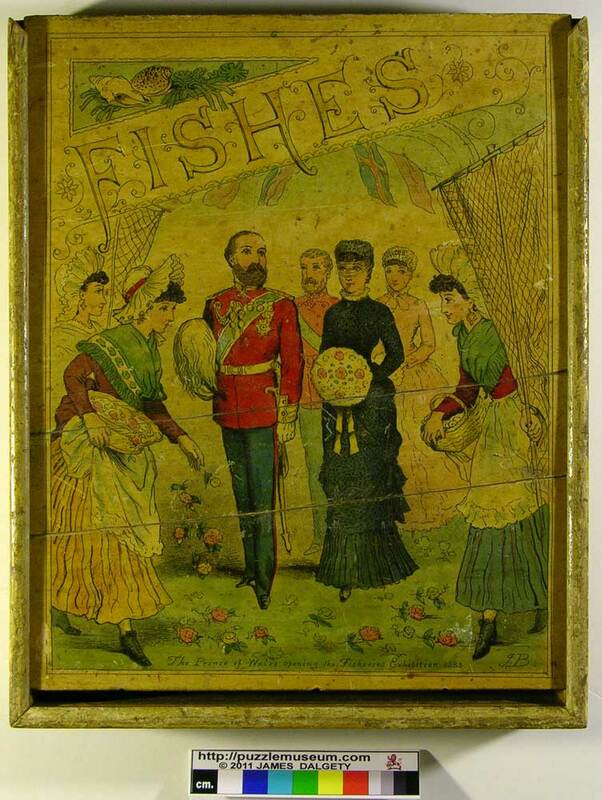 The box lid shows the Prince of Wales opening the 1883 International Fisheries Exhibition in London. 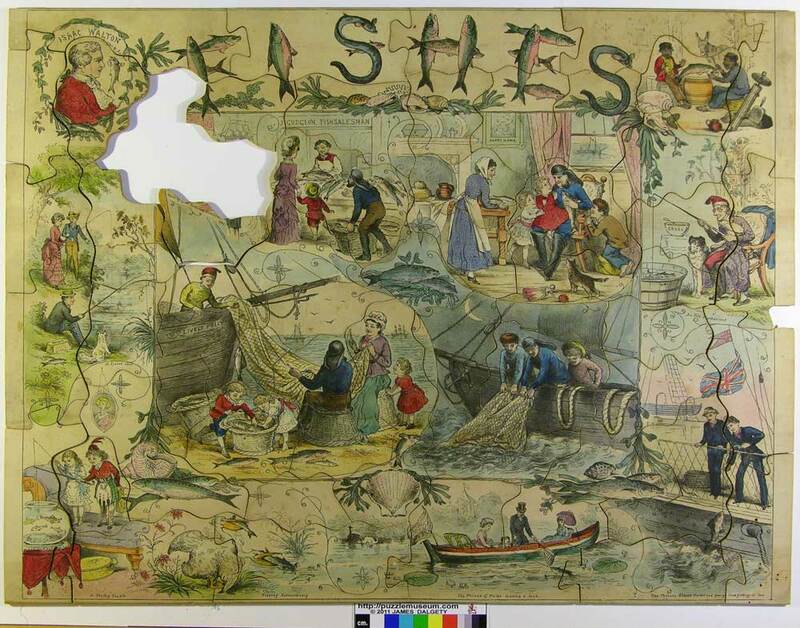 The main picture illustrates many fishing related scenes. 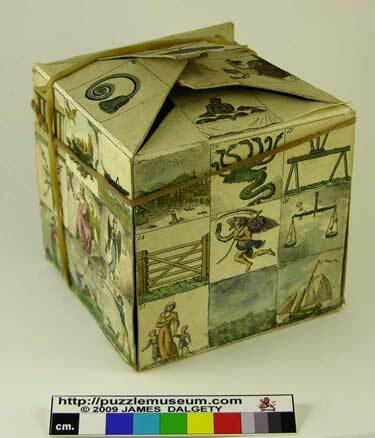 We got the box because its source suggested it might have contained a puzzle; however we haven't a clue. The paper the box is covered with is a high quality deep red embossed paper suggesting that it is 19th Century. What was in originally the box? Is this a photo of Professor Hoffmann? 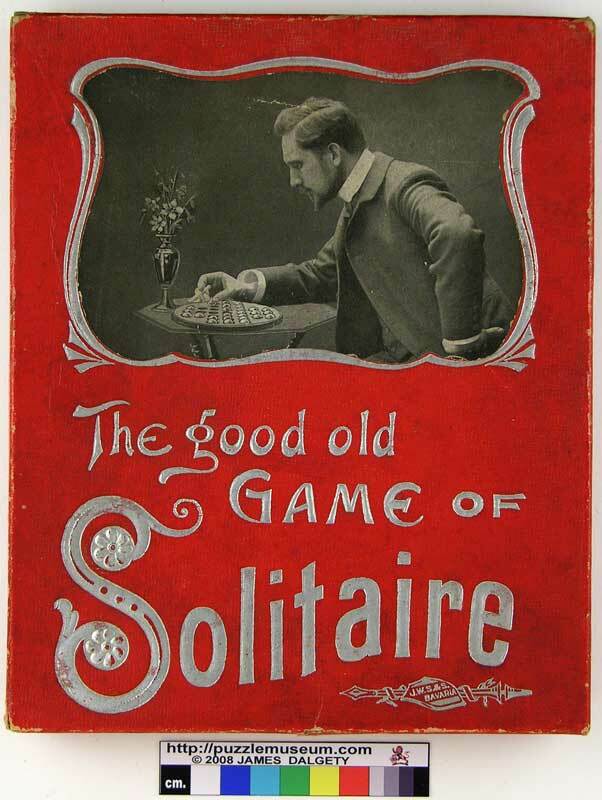 This Solitaire game was made by Spears and Son around 1900. Our near senile senior curator has now forgotten who told him that the photo was of the great Professor Hoffmann (Angelo Lewis); and so we are looking for a second opinion, or even better some evidence. 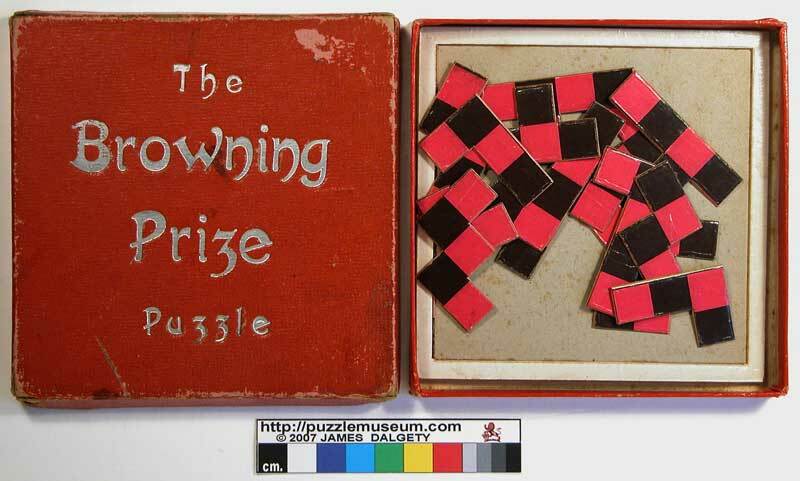 Why is this called "THE BROWNING PRIZE Puzzle". 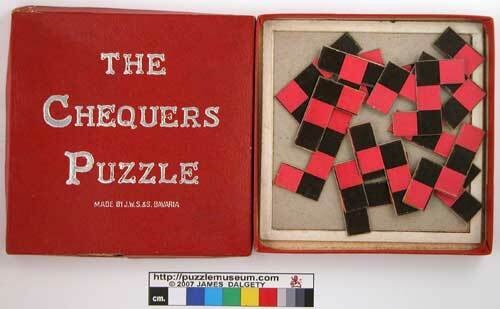 Almost certainly made by J.W.Spears & Son in Bavaria before WW1, and sold by R.Journet as "The Chequers Puzzle". 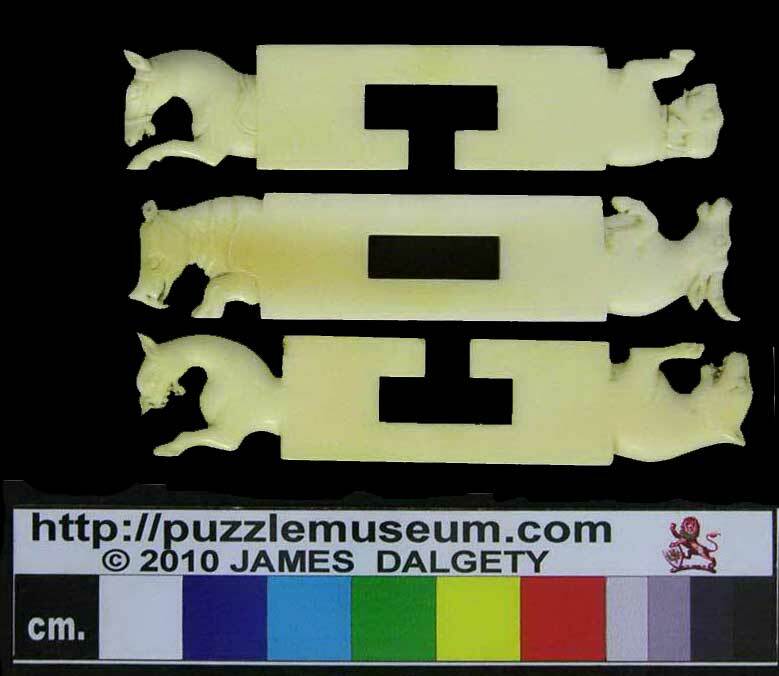 The "Checkers" or Browning Prize Puzzle. Was there a "Browning Prize" perhaps for Draughts, Chess, or Checkers? Journet used both spellings Chequers and Checkers in their advertisements. Do you recognise the wisemen? They almost certainly date from 1880 to 1900. It is possible that they are fictitious but we think they may be based on real people. The bearded one in the middle is Lord Salisbury (d 1903) and next to him with the curly moustache and bow-tie is Randolph Churchill. Behind Churchill is the elderly Gladstone (d 1898). I think the one with the peaked cap is William Booth. The two on the left I thought were Lord Granville and Lord Palmerston but these would be 30 years too early – unless they are meant to be retrospective. The man at the back with the wide brimmed hat is a puzzle still. Looks like Robert Louis Stevenson but I have never seen an image of him wearing specs. Can you improve or add to the list? 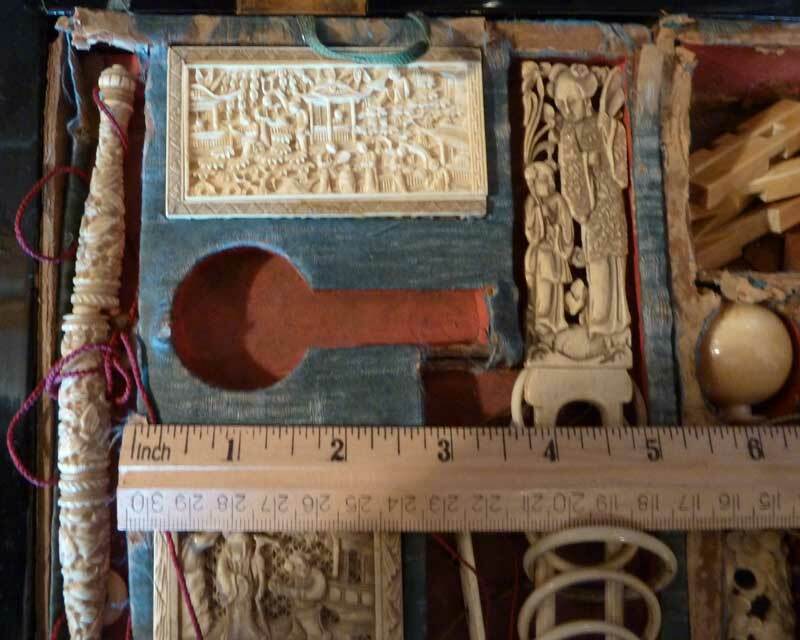 This inlay and coin are inset into the lid of a Cigar Case with a puzzle opening. Can you translate the writing on the wood for us? WHAT IS THIS 33 x 33 BOARD? 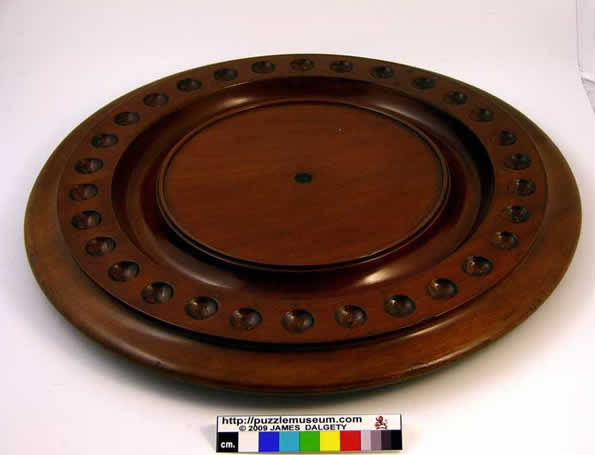 A sturdy well made mahogany board on bun feet 17 x 17 inches with 33 x 33 holes. 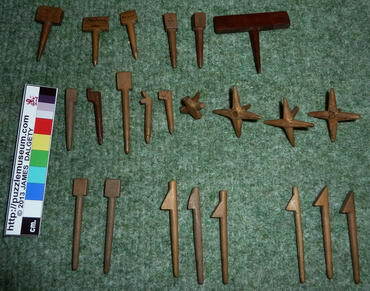 Box of curious pegs of which there are 3 main types which we will call Spades, Flags, and Barbs. Specials 15 all light., if anything these are better made than the rest. (The three in the left back row of photo 3 have tapered "blades", being sharpest at the top. 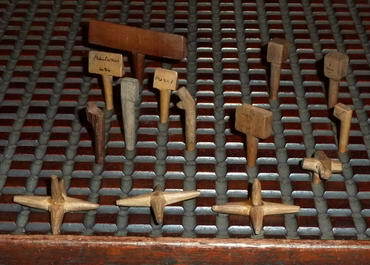 The one back right has a circular profile groove on which one could support another peg on its side. 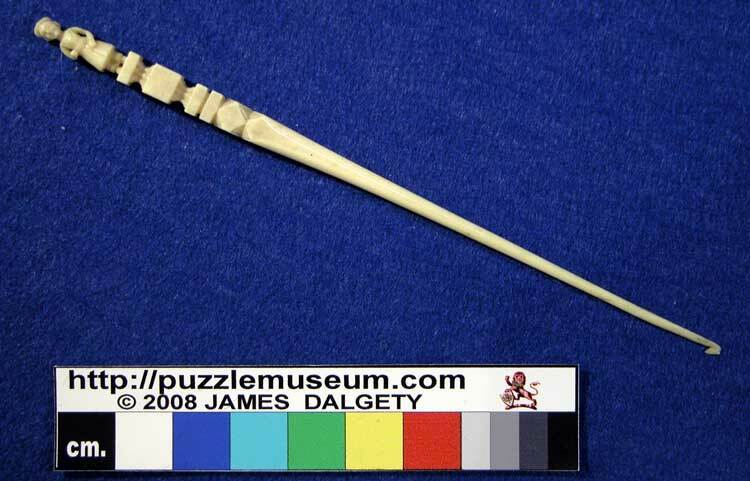 The peg with the groove on top has an illegible 3 lines: I can only guess "?????? of ??????". Might it be a game or is it something else. We need the rules for the BISMARCK'S PUZZLE. This appears to be Otto von Bismarck (1815-1898). 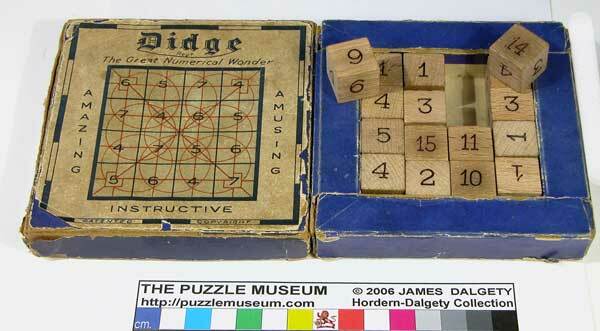 This suggests it may well be an early way to get around the parity problem inherent in the 15 puzzle. Without any rules we cannot be certain. 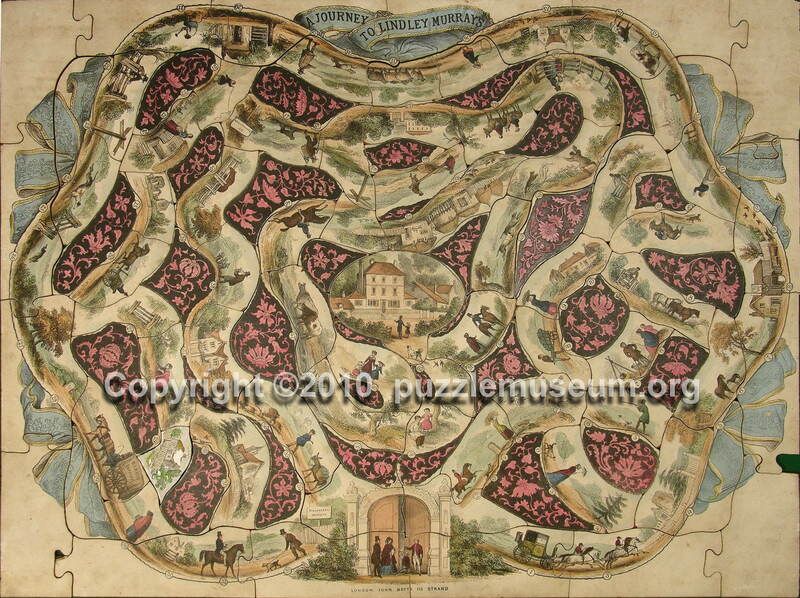 Do you have the original rules for this puzzle? We want a copy of the key-sheet to "The Great Volunteer Review, 1899". 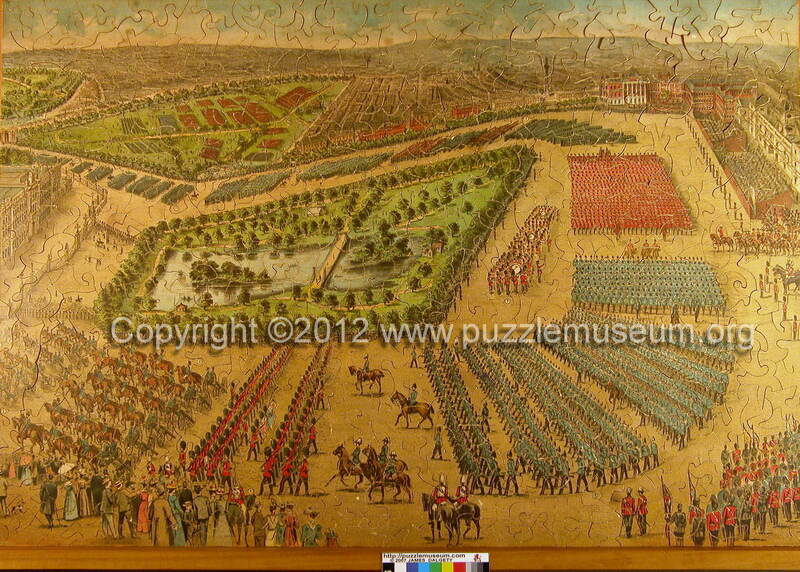 A wonderful 608 piece wooden jigsaw of a bird's-eye view of the British Army parading around Hyde Park, London, prior to departing for the Boer War in South Africa. 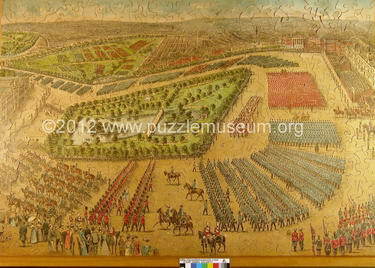 The picture has a small numbers printed by each of the regiments; so we want to locate a copy of the key to these. Do you know where the picture originates ? 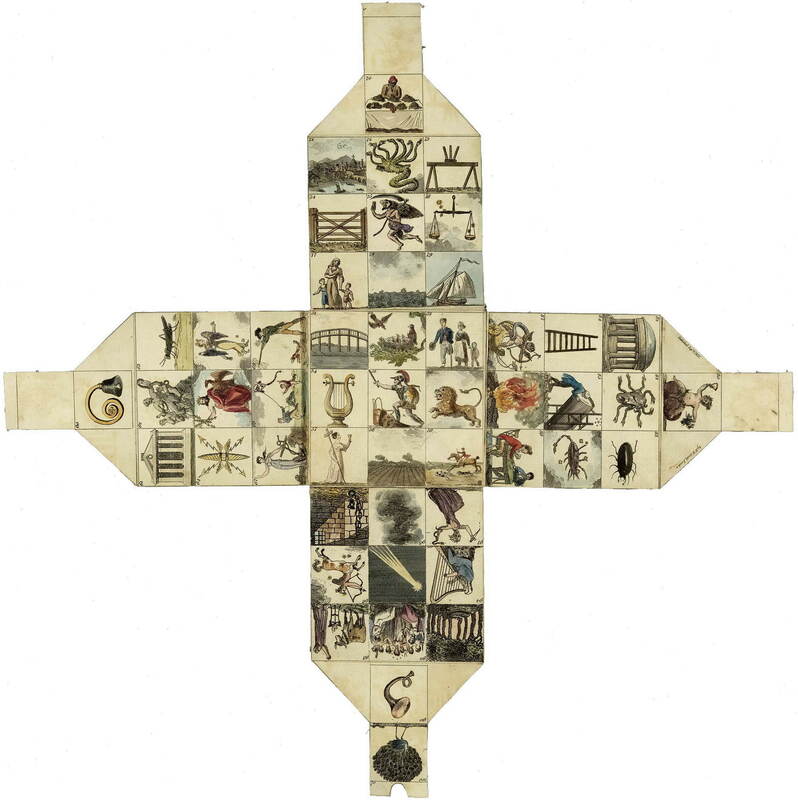 We want too know the rules of the Game of "A Journey to Lindley Murray's"
This beautiful jigsaw published by Betts around 1849 is also a board game. Each of the vignettes along the track are numbered. Can you tell us where to find a copy of the rules? Lindley Murray was a famous American who came to England to teach us grammar. Nobody solved our Winter 2011 solstice rebus. Do you know this sculpture? Do you recognize the signature below ? 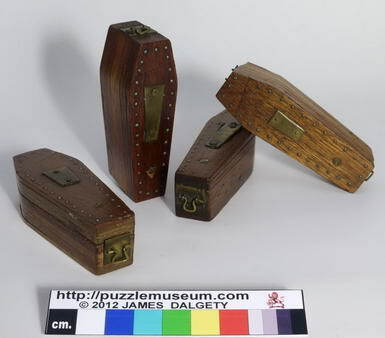 These are well made and well naughty puzzle boxes but who made them and when? We now know of six examples, so someone had a significant craft business. 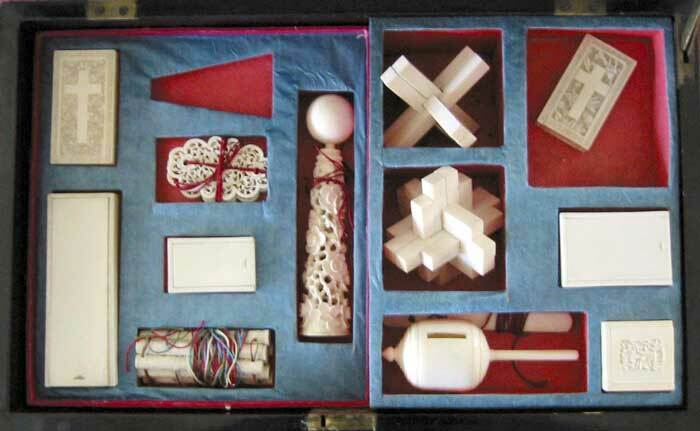 The most elaborate one has two puzzles and 10 separate or moving parts. When we have the answers we will feature one as Puzzle of the Month. Take snuff and likewise you may "snuff it" and then you will become a stiff un. Does the style of writing help you date them? 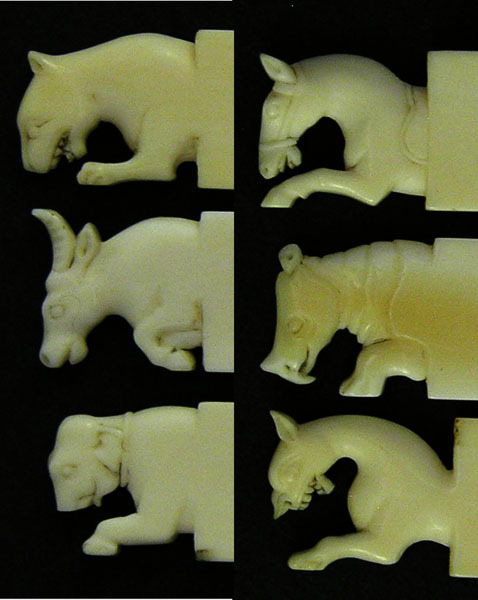 We hoped that, if we knew what the animals were, we might be able to deduce where the puzzle came from. Not sure about the lower right beastie. JR thinks it may be a heraldic tiger - Any better suggestions? 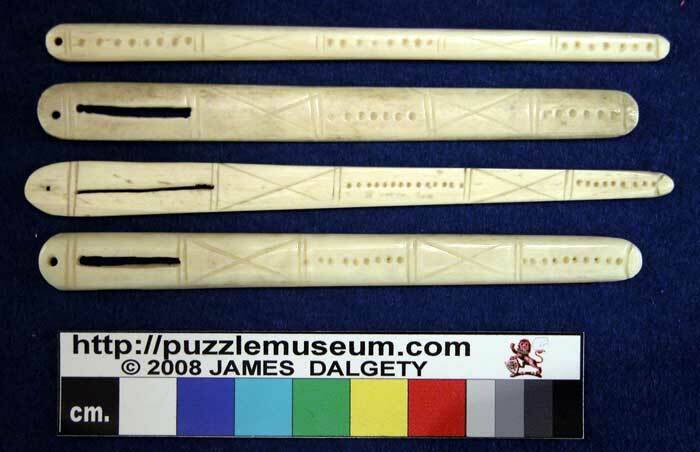 This Stabbing Game or Dexterity puzzle came from the Eileen Scott collection in the 1970s. Both she and we think the figure looks as if it came from Easter Island or Africa. Can you identify the style? 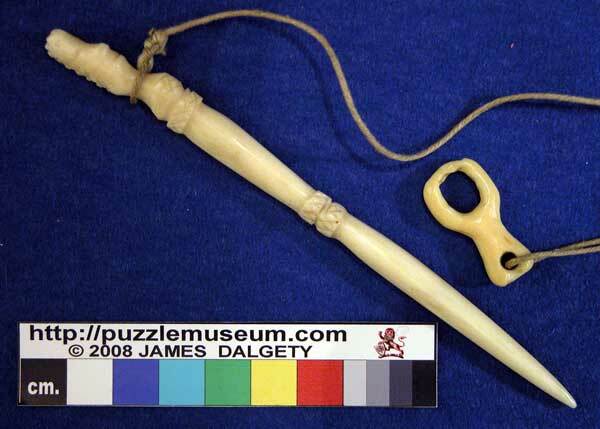 This is probably a crochet hook. Do you know when and where it was made? What is this? Is it a thread winder? 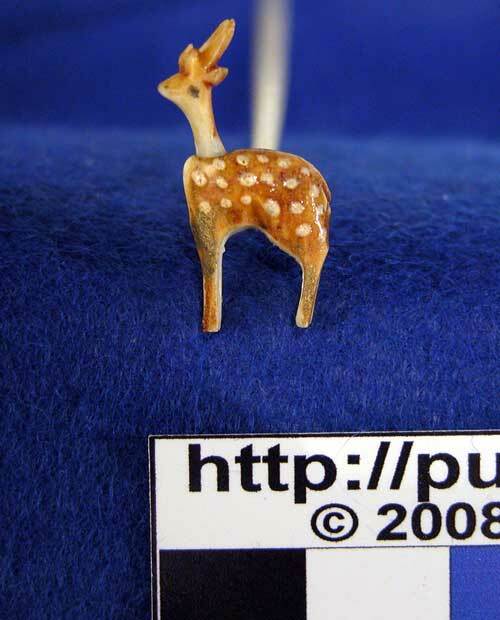 A tiny deer on the end of an ivory stick. The deer's head is attached with a springy bristle so it moves. 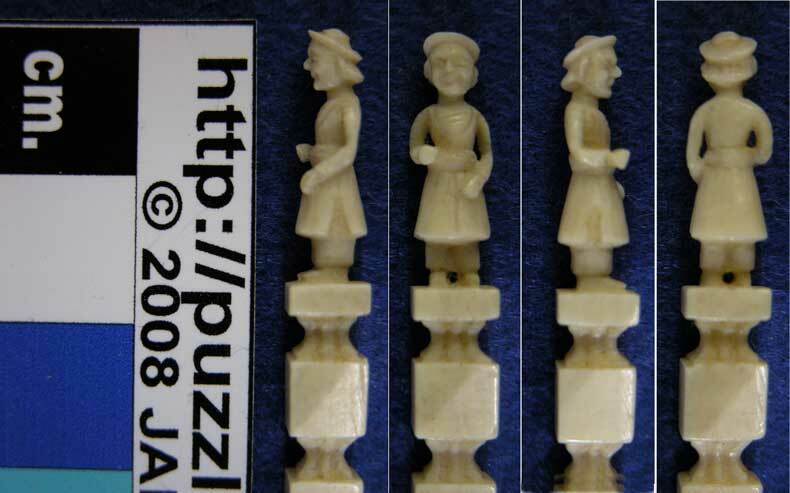 What are these curious ivory items? 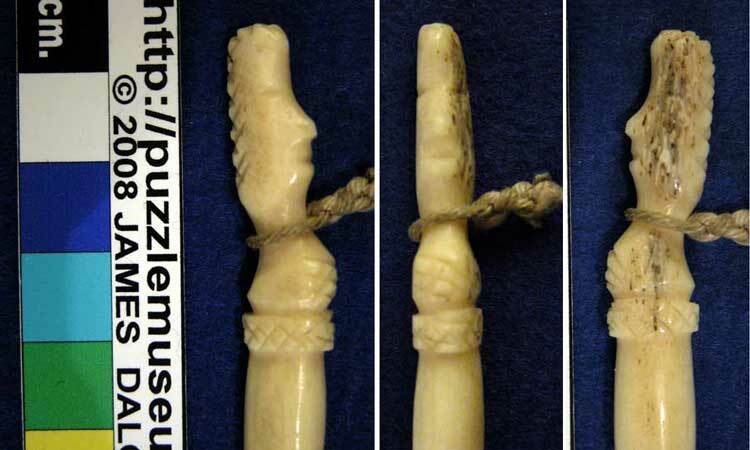 Are they a demonstration of the carver's skills or are they part of an elaborate game of Spillikins? 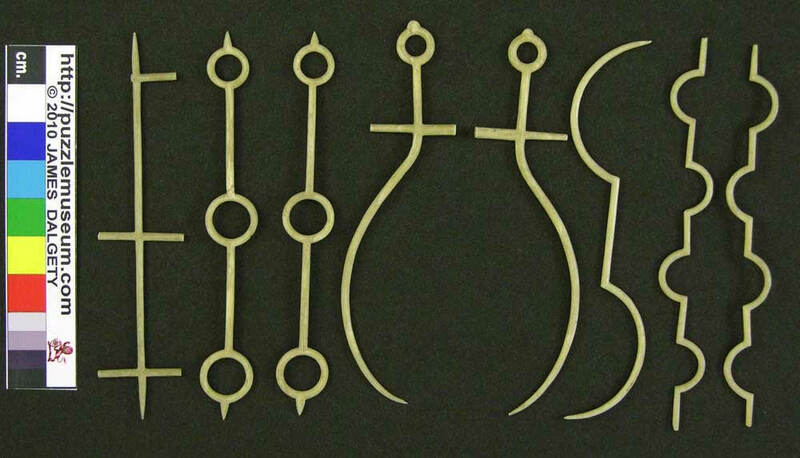 We would have little doubt that these were bodkin needles except for the fact that they were found, individually, included in different sets of Spillikins. Are they bodkins, if so from where? If they are Spillikins, what do they represent? Do you know an expert on Spillikins? Were there standard tools and weapons in most 19th Century sets? What belongs in this curious 4-sided space? What belongs in this curious club shaped space? We discovered this one! It was a whistle with a ring shaped handle! 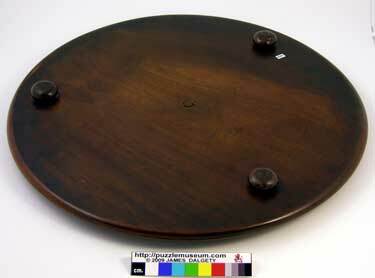 What is this 5 inch (12.5 cm) diameter object ? We now know of three of these. Pressed or stamped from sheet brass. It has a stamp on the edge "H S H protected". We have been unable to identify this mark unless perhaps it is for Hamer Steam Hammers in Halifax,UK. 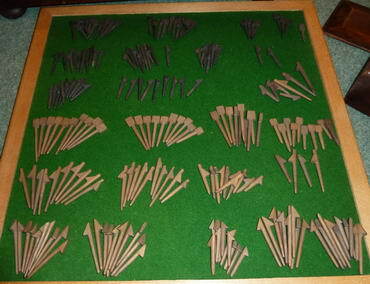 As at September 2014 John Beasley has made an extensive study of the Solitaire puzzles that may be played on this board. However we have no evidence that it was actually manufactured as a Solitaire board. Alternative suggestions have included that it might have been a WW1 jig for selecting steel balls from a bulk container ready for assembly into a ballrace. We need sight of a catalogue or instruction sheet before we can be certain what it was made for. Can you help? We need the instructions please. What are these two wooden pieces? The hemispherical shaped depressions in the base of the soldier does not quite match the cavity in the top of the piece on the left. The "cups" have a diameter of about 27mm. 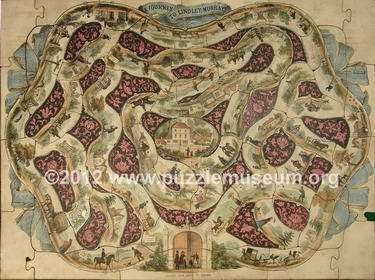 This board looks as though it was made around 1870-1890. What game or puzzle was played on it? 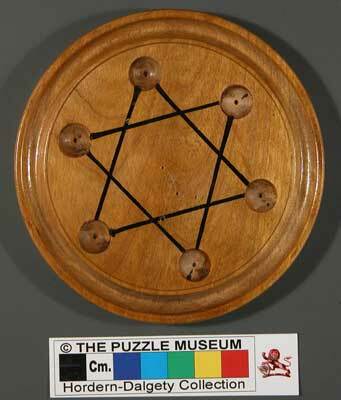 Please note that it is not the 8 pointed "Octostar Puzzle" . What is this extraordinary print. A Game, a Puzzle, or an Oracle? Published by W.H.Crook, London 1812. It folds up into a cube, which is 9.3 cm. along each edge. 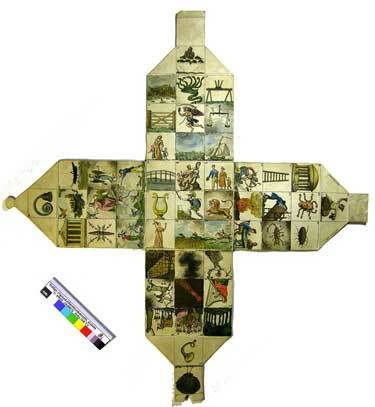 The unit squares depict all manner of things and are numbered from 61 to 100. Was there originally another part numbered 1 to 60? 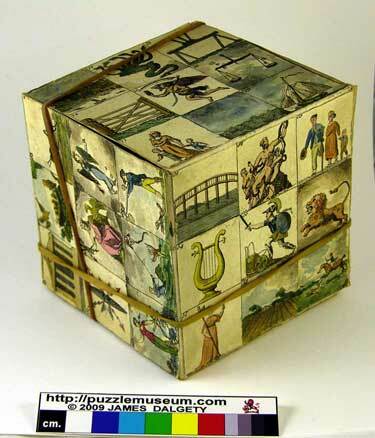 We have used rubber bands to hold the cube in shape for these photographs as the original tabs are now very weak. We have now discovered that the Yale Center for British Art, Paul Mellon Collection has a pair. Curiously theirs is mounted on linen. Opposite, with their kind permission, we show the "other" cube. We are still none the wiser as to how they were used. 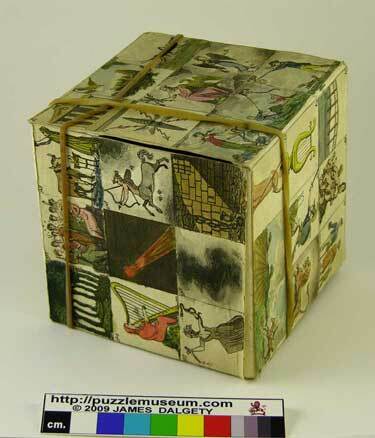 Have you got this puzzle or game? We think this beautiful board (33 cm. diameter) is for a puzzle called TRENTAL. We think it should have 30 balls and 20 or so pieces that look like turned Trees about 3 to 4 cm. tall. We badly want a copy of the rules, and if found, a set of the balls & "tree" pieces. Maybe someone out there has a nice mahogany box full of all that we are missing. The bottom of the board. How old is this gold 3-band puzzle ring, and from where does it come ? Several Jewelry experts have looked and suggested ages of 150 to over 600 years old. The key to the correct date must lie in the script and meaning of the script. The first suggestion was that they were a stylized form of IHS; however now we have had three people tell us that the characters should be orientated as shown in the upper illustration, and that they are DEVANAGARI. 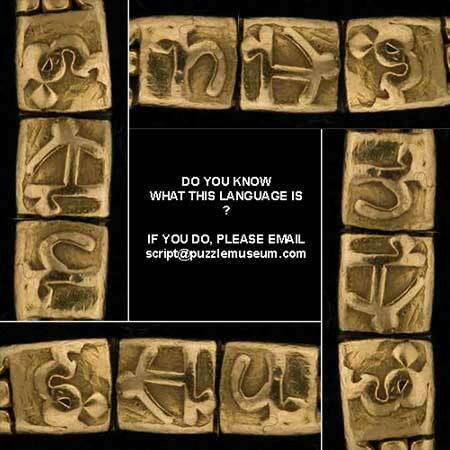 If this is correct then our gold puzzle comes from Northern India, Nepal or thereabouts. Can anyone deduce the precise location, their age, and the meaning? If so, please email us! Possibly we are wrong and have the writing the wrong way up. Is there a completely different interpretation? JG of Chicago won a puzzle prize by locating the ring that appeared in this picture from a Pictorial Encyclopedia of around 1910. 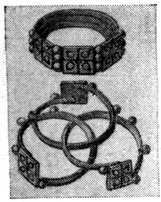 It is a medieval puzzle ring which splits up into three interlocked rings and is very similar to our's. What is this curious object? 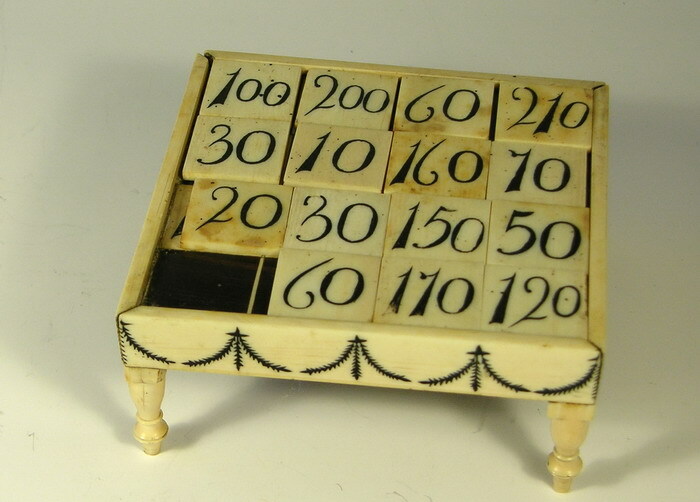 A small bone or ivory tray on legs containing 15 tablets. 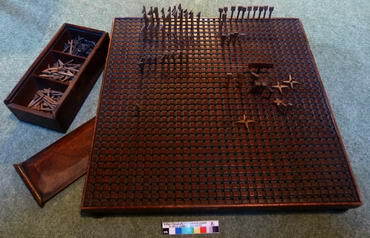 The solid tray is divided 4 x 4: Half the squares are numbered and half are rosewood. The values are shown in the table opposite thus number 10 has number 90 on its reverse. Can you tell us what it is? A Puzzle, A Game, or something else? Is it missing one piece? If so what numbers should be on the missing piece? 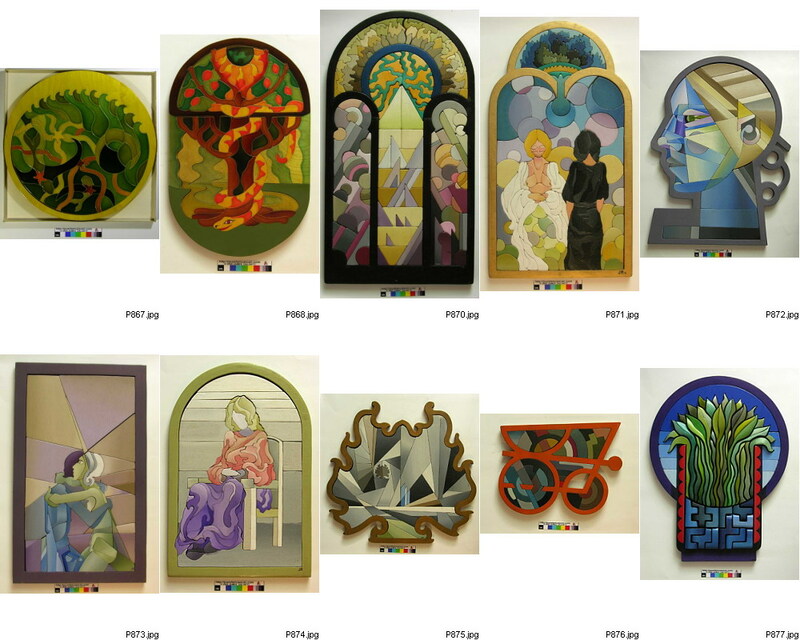 Can you tell us about, or put us in touch with, the 3 makers of these beautiful Jigsaw puzzles from the mid-1970s. ? Initials of two are JM and JN. 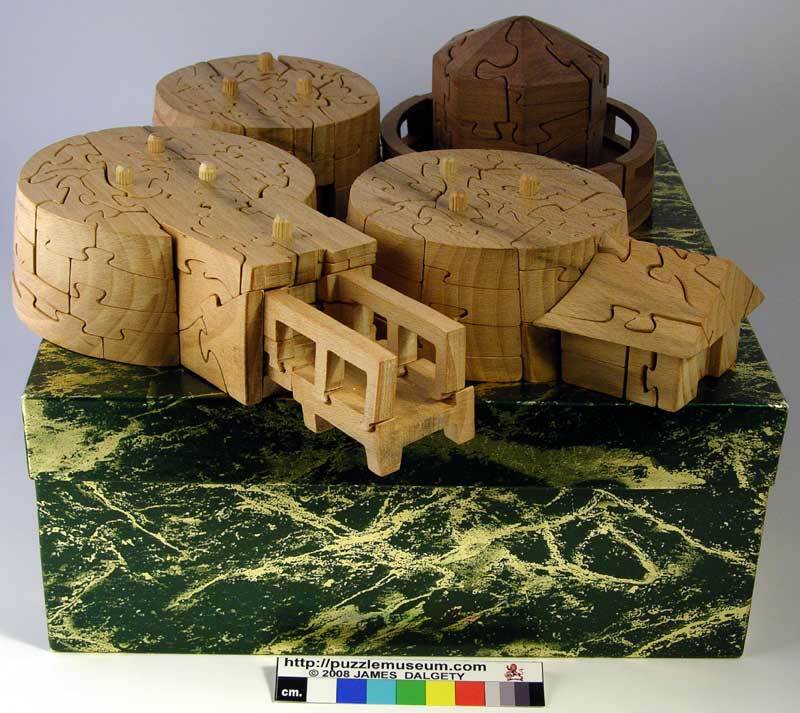 Who made these wonderful 3D Jigsaws in the 1990s? What is the script on the Napkin Ring? What does "1/6 ME A DOG" mean? Please email us if you can help with any of the above questions. 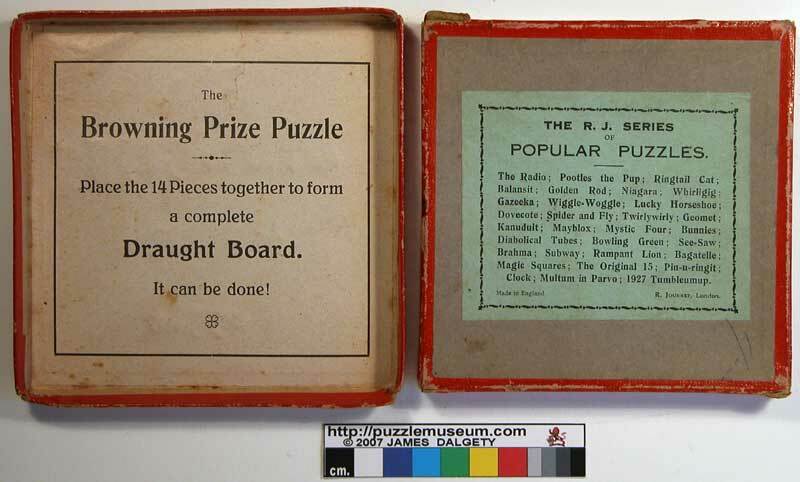 We give puzzles as prizes for the best publishable solutions! Click here to see some of the solved queries.